NIAMEY, Jan 17 (Reuters) - At least five people were killed on Saturday in protests in Niger against Charlie Hebdo's cartoons of the Prophet Mohammad, authorities said, bringing the death toll from two days of violence in the country to 10. 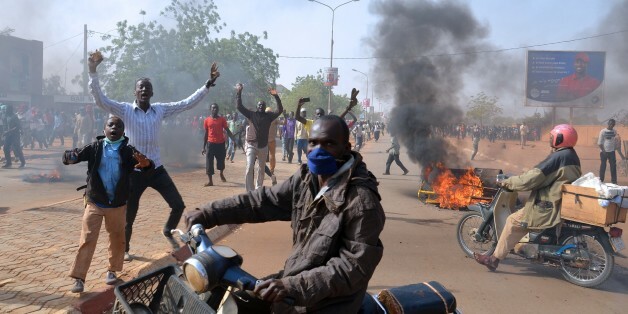 Police fired tear gas at crowds of stone-throwing Muslim youths who set fire to churches and looted shops in the capital Niamey after authorities banned a meeting called by local Islamic leaders. A police station was attacked and at least two police cars burned. "They offended our Prophet Mohammad, that's what we didn't like," said Amadou Abdoul Ouahab, who took part in the demonstrations. President Mahamadou Issoufou said all five of the dead were civilians, with four of them killed inside burned churches or bars. He said an enquiry would be opened and those responsible for organizing the violence would be punished. "Those who pillage religious sites and profane them, those who persecute and kill their Christian compatriots or foreigners who live on our soil, have understood nothing of Islam," he said in a televised address. The president added, however, that he shared the disgust of Muslims who felt offended by the caricatures of the Prophet Mohammad and that freedom of expression should not mean liberty to insult religious beliefs. Issoufou joined a march in Paris last weekend alongside French President Francois Hollande, in the wake of a gun attack that killed 12 people at the offices of satirical weekly Charlie Hebdo, which had angered many Muslims by printing cartoons of Mohammad in the past. But Issoufou said on Saturday he had wanted to demonstrate his opposition to terrorism and not support for the newspaper itself. Calm returned to the streets of Niamey on Saturday afternoon but a demonstration called for on Sunday by opposition groups could revive the tension. Authorities on Saturday banned the march but opposition leaders said they would proceed anyway. Demonstrations were also reported in regional towns, including Maradi, 600 km (375 miles) east of Niamey, where two churches were burned. Another church and a residence of the foreign minister were burned in the eastern town of Goure. Niger's 17 million people are almost all Muslims, though its government remains secular. With the influence of moderate Sufi brotherhoods, Niger has avoided the armed Islamist uprisings that have shaken neighboring Nigeria and Mali, but there have been growing protests by hardline Muslim associations over social issues. The attack by two gunmen on Charlie Hebdo's offices in Paris sparked massive demand for the next issue of the weekly, which put an image of the Prophet on its front page to mark the bloodbath. That again outraged many in the Muslim world, triggering violent demonstrations in Algeria, Niger and Pakistan on Friday. French Foreign Minister Laurent Fabius condemned the violence in Niger, a former French colony in West Africa where it stations troops as part of a regional counter-terrorism operation. "France expresses its solidarity with the authorities in Niger," he said. Four Muslim preachers who had convened the meeting in Niamey were arrested, police sources said. The French embassy warned its citizens not to go out on the streets. The death toll from Friday's clashes in Niger's second largest city of Zinder rose to five after emergency services discovered a burned body inside a Catholic Church. Residents said churches were burned, Christian homes looted and the French cultural center attacked. A police officer and three civilians had already been confirmed killed in the demonstrations, police sources said.